NUREMBERG, Germany, Feb 18 (Reuters) - World No. 3 sportswear maker Puma (PUMG.DE) reported a 76.7 percent drop in fourth-quarter operating on Wednesday, missing analysts' estimates, as it prepared for difficult times ahead. Puma, owned by French retailer and Gucci owner PPR (PTRP.PA), refrained from giving an outlook for 2009, saying it was difficult to give a forecast due to the market environment. "We have implemented measures in the fourth quarter to prepare us properly for the coming year and will react flexibly to further changes in the market environment," Chief Executive Jochen Zeitz said. Fourth-quarter earnings before interest and tax (EBIT) fell to 12.2 million euros ($15.43 million) from 52.4 million in the same period a year ago, below the average estimate of 48 million euros in a Reuters poll of 10 analysts. Fourth-quarter EBIT took a 25 million euro hit from steps including writing down the value of inventory as well as closing unprofitable stores. Consolidated sales rose 11.3 percent in euro terms to 561.3 million euros, beating estimates. Puma, which itself had aimed at a mid- to high-single-digit sales growth, said order intake was down 5.4 percent as of the end of 2008 at 1.15 billion euros. Puma shares dipped 0.2 percent to 132.50 euros by 0923 GMT, outperforming a 1.5 percent drop in the German mid-cap index .MDAXI. Data showed last week that Europe's biggest economy shrank at a record pace in the last quarter of 2008 as global demand for its manufactured exports sank and dented investments. Nike (NKE.N), the world's largest athletic shoe and clothing maker, said last week up to 4 percent of its workforce could be cut amid an ongoing business review. 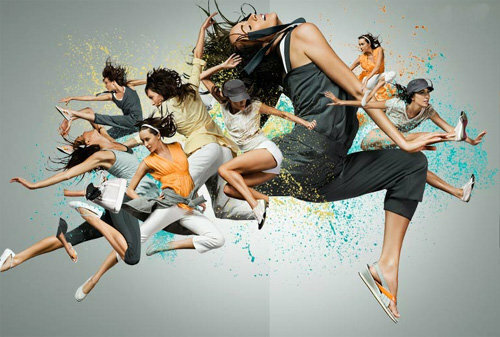 Adidas (ADSG.DE), the world's No. 2 sport goods maker after Nike, has said it planned to cut 300 jobs at its Reebok brand and 70 at TaylorMade. Puma has said it so far did not plan any job cuts in the United States. According to Thomson Reuters StarMine, which weights analysts' forecasts according to their track record, Puma shares trade at about 8.5 times 12-month forecast earnings, a discount to peers like Adidas and Nike.